Home / kl / malaysia / malaysian / mood republike / news / pwtc / shopping / year end sale / KL Y.E.S festival happening this weekend! KL Y.E.S festival happening this weekend! Get ready to shop till you drop! The biggest sale of the year will take place at Putra World Trade Centre (PWTC) from 19 to 21 December 2014. Organised by event planner team Mood Republik, the three-day event will have over four hundred big local brand names gathering under one roof. Some of the brands are Bella Ammara, Sugarscarf, House of Doll by Fazura, Aidijuma, Qaira Hijab, Allya Mysara, Jubah Souq, Dreemika and plenty more! The event will start at 10am sharp until 9pm. Moreover, the event is not just a shopping event, it is also a charity event. 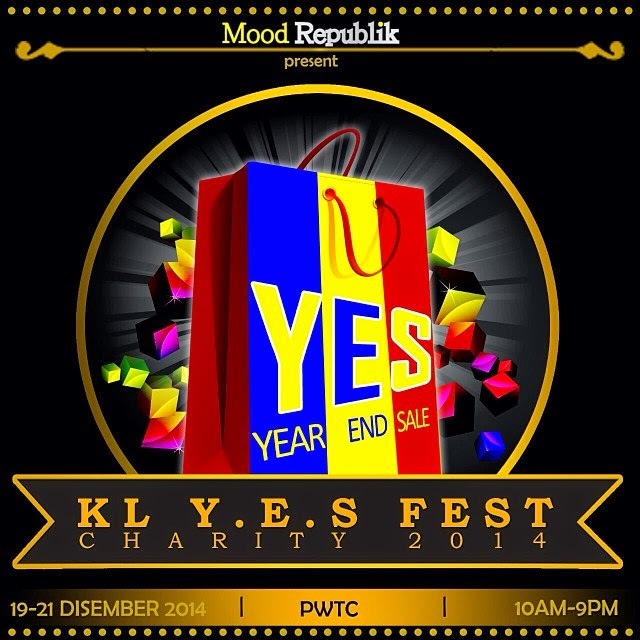 Every vendor at the festival will contribute some money from the profits they made to KL Y.E.S charity 2014. The fundraising money will be channelled to Love Kemboja, Love Tanzania, Love Rohingya and Harapan Special Children Care Center at Seremban. For more information, visit Mood Republik Facebook page.